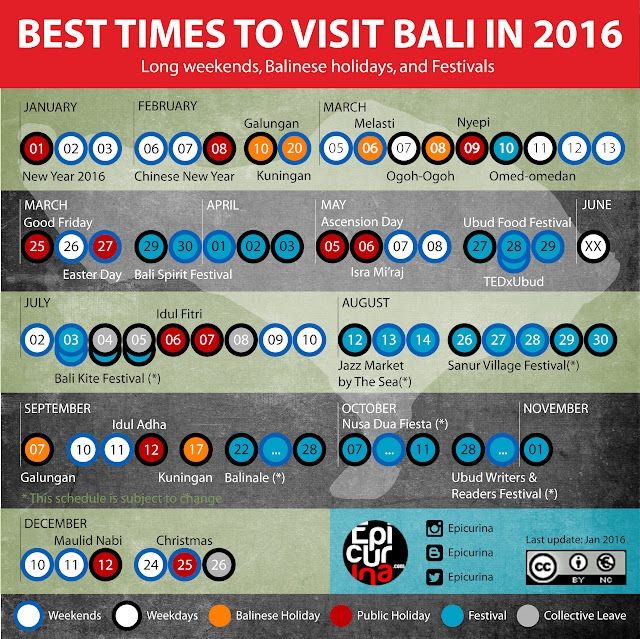 Planning your holiday in Bali this year? Here at Epicurina we rounded some of the best times to visit Bali in 2016, which includes Indonesian long holidays, as well as Balinese ceremonies and food related festivals that might interest you in. With the contrasting scene of Bali, where almost its entire population are devoted Hinduism, with the country where it exist, Indonesia, where its 85% population are muslim, Bali is unique. Often seen as the escape destination, big city dwellers comes to Bali for a little retreat and relax moments, drawing back from their hectic business days. As for the foodies, holiday in Bali is seen as the time to adds up on their craving for pork based dishes. From the famous Babi Guling (Spit roasted pig) literally found on every corners of the city, baby back ribs with lychee martini, to crispy fried pork belly served on fancy restaurants, the kind of dishes not so easily found in other Indonesian cities. With such contrasting situation, inevitably all the other Balinese dishes are hidden in the shadow of Babi Guling, which create an impression to the general public that Bali is all that. Generally means roasted pig, it's the superstar of Balinese dishes, which inevitably creates the common impression that all Balinese dishes are pork-based -- which is not true -- but let's talk about this one first. The word "Be" in its original meaning is equal with "fish" -- the main source of protein Indonesian ancestors known. However through changing of generations, it nowadays basically means "meat" or anything you eat with rice in a more broader term. As pork is the most common meat in Bali, "Be" when using alone is synonymous with pig, hence Be Guling means "pig that's cooked by rolling it over (indirect heat)". Be Guling using the huge pigs should be called 'Balinese spit roasted pig,' while those using the young infant ones, those that's still being breastfed, could be called 'Balinese roast suckling pig'. Naming a whole 1.5 meters long pink swine a "suckling pig" therefore is like calling full grown Mastiff dog a puppy. Be Guling are first stuffed with seasoning and assorted vegetables like cassava leaves, then slowly cooked over open fire, constantly rolling it while occasionally applying layers of fresh coconut water. The good Be Guling are usually marked with the crispy crackling, and still moist meat. Lawar was initially created only during big religious ceremonies, where all of the Banjar's (village) men gather around to help preparing the dish, under the command of the Banjar's Lawar Champion: someone who's considered to have the most delicious recipe for Lawar in the whole village. Basically a salad, Lawar are consisted of chopped vegetables, shredded coconuts, and traditional Balinese seasoning comprising of Base Gede (main seasoning), Base Penyangluh (savory flavoring agents), and Embe (shallot based). To add texture and flavor, finely chopped meat are added in. Now here's the interesting part: traditionally, to adds color to the pale colored mound, fresh blood are added in. This style of lawar are called "Lawar Merah" or Red Lawar. For those who don't really fancy fresh blood, and for some ceremonies that forbids it, the no-blood "Lawar Putih," means White Lawar, is created instead. As the type of meat used in lawar, it can be anything from the most common: pig (celeng), to chicken (siap), duck (kuwir), water buffalo (kebo), lamb (kambing), beef (sampi), squid (cumi), octopus (gurita), snails (kakul), or even the vegetarian ones like coconut (nyuh). and young coconut shells (klungah). Thought to be originally created by Men Tempeh in the Gilimanuk area, Ayam Betutu is a stuffed chicken dish that's slowly cooked for up to 14 hours in traditional Balinese seasoning. The result is a succulent chicken meat robust in flavor that seep deep in. Originally Betutu taste very hot, thanks to the very spicy Balinese chilies used. Beside of chicken, duck (bebek) is also a common poultry to be cooked in Betutu way. Basically Nasi Ayam Khas Bali is a mixed rice plate consisting of all-chicken parts cooking, usually revolving around Ayam Betutu as the main attraction of the dish. The difference is in the side dishes, which could consist of up to ten different dishes like Ayam Bumbu Kuning, Sate Lilit Ayam, Kulit Ayam Goreng, Hati dan Ampela, Telur Ayam, or even batter fried shrimp. Tipat Kuah/Sayur is the watery version of Nasi Ayam ("kuah" and "sayur" both means soup in this sense), which instead of using Nasi (rice), it uses rice cake (tipat). Other than that tipat Sayur usually consist of the same components like Nasi Ayam, plus the additional thin curry like broth poured over the combo. Tipat Sayur, despite using the word sayur (soup) is a full-meal in its own. Sate lilit is a type of satay that's formed by mound made using minced meat, shredded coconut, and Balinese seasoning. While just like lawar, Sate Lilit can also use any kind of meat, the most common ones are those using fish, and known by the other name as Sate Languan, or Sate Lilit Ikan Laut. As the name signify, Sate Languan uses only saltwater fishes, like Tuna, Skipjack, or bigger fish like Marlin. Hailing from the central region of Bali, Be Jair Menyatnyat is considered a dish unique to Bangli, the only district in Bali without shorelines. What Bangli has instead, is the vast lake of Danau Batur in Kintamani, where Mujair (Tilapia) is cultivated here. Other than Mujair, Gurami is also a common fish cooked in Menyatnyat style. Name wise, Menyatnyat comes from the Balinese word "enyat" which mean 'dried out of water.' 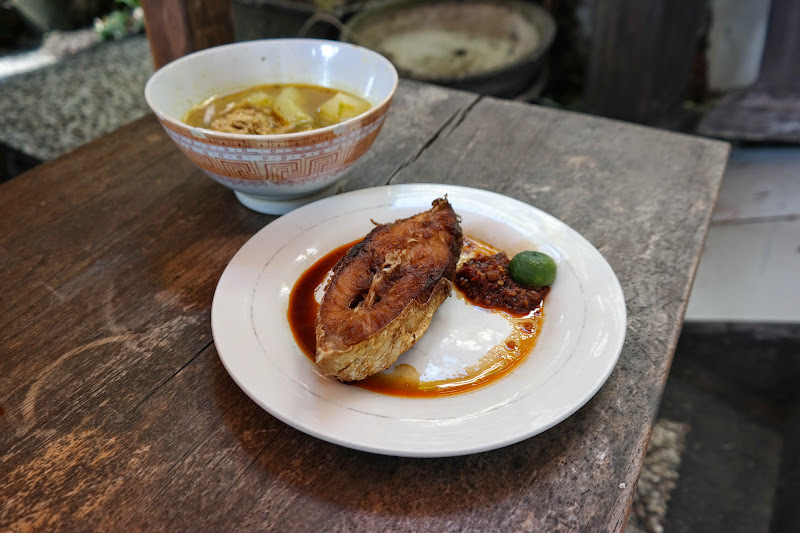 As the name implies, Menyatnyat cooking style involving frying of the fish, then boiling it in Suna Cekuh concoction made of garlic and lesser galangal, until the water dries up. Perhaps the youngest entry to the traditional Balinese dishes, is the grilling style used for fishes and seafood, which originated in Jimbaran area. Jimbaran is one of Bali's villages that have good access to the sea, and within a close distance from the Ngurah Rai Airport. This particular combination boosted up Jimbaran's popularity, which now houses several hotels and resorts from well known brands. Basically Jimbaran style grilling revolves around the savory sweet, tad spicy thick seasoning sauce used to season and coat the fish during the grilling. Beside of the fishes, the more famous variant of Ikan Bakar Jimbaran is actually its Grilled Clams, which are cooked in its own shells. Tipat Blayag is a dish originated from desa Penglatan, in Singaraja. Tipat Blayag are consisting of slices of rice cakes (tipat/ketupat), bathed with thick curry-like sauce made from Base Genep Balinese seasoning mixed with rice flour. Tipat Blayag originally served with Urab sayur, Ayam Sitsit, chicken feet's crackers crispy fried chicken skin. The common taste of the dish is savory, spicy, and also fresh as it contains the vegetables from Urab. The basic ingredients of sambal matah are chopped shallots, bird eye chillies, minute amount of dried shrimp paste, and coconut oil sprinkled on deliberately. As the name implies, Sambal Matah (matah means raw) uses only raw ingredients, though some prefers lightly sauteing it for better shelf live. Sambal bongkot is quite similar with Sambal Matah, with the addition of bongkot (kecombrang, torch ginger flower) that adds the unique fragrant aroma. Originally a sambal, the spicy condiments that people all over Indonesia are so fond of, Sambal Matah and Sambal Bongkot can also be found mixed with other ingredients, creating a different dish on its own, for example: Tuna Sambal Matah, Ayam Sitsit Sambal Bongkot, and so on. Sup Kepala Ikan literally mean Fish Head Soup. While the cooking exists in many different culture, the Balinese one are consisting of clear soup with Base Genep savory spicy seasoning. It usually served with a slice of deep fried fish, and spicy hot sambal merah. Snapper and Grouper are among two of the mostly used fish for Balinese Fish Head Soup, served whole, while giant Tuna and Pomfret are also notable choices, and served as chunks considering it's giant whole size.